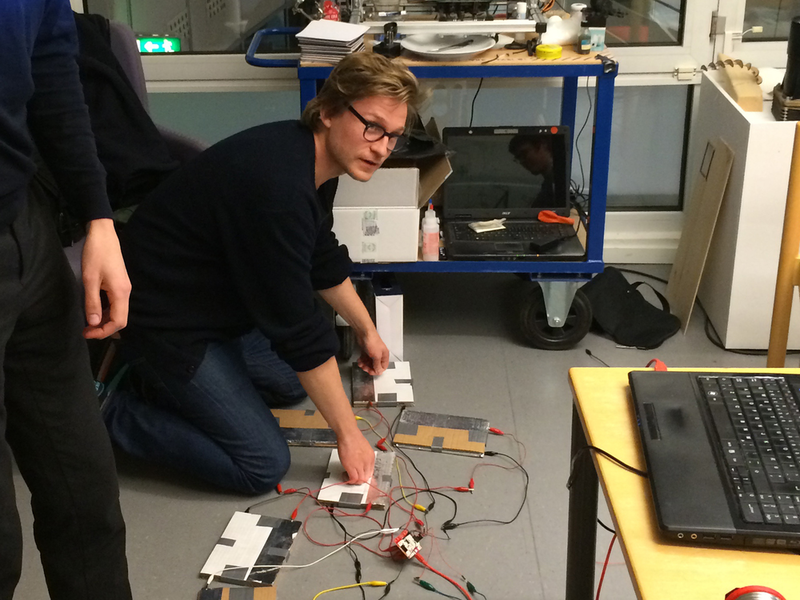 We wanted to build a fun game for the open house event at Umeå Institute of Design. After trying out many different games we decided to supersize the old NES controller to play the legendary Mario game. The old NES controllers have a simple layout with four buttons for direction, a start and a select button and two action buttons. To enhance the game, we wanted to make it a team experience - instead of having one person controlling Mario, two people now have to collaborate and align their actions to make Mario move. This meant that we would change the interaction from pressing the buttons with fingers to pressing them with feet. That's why we placed it on the floor and upscaled the controller. We made each button out of cardboard wrapped in aluminium foil. By layering two conductive carboards sandwiched with a thin piece of foam, there is no electricity running in the idle state of the button. A hole in the foam layer allows the circuit to close as soon as pressure is excerted on the button. Being connected to Makey Makey each button press is sent to a computer that projects the game onto the wall.